There is more information available on this subject at Neill Blomkamp on the English Wikipedia. "I love Halo. Still. But I seem to have a bad track record of turning existing franchises into films. haha, Do I love the world? Master Chief? Reach, the Colonies, the Flood, the Covenant? YES. Am I going to end up directing a piece in that world? probably not--meaning no one is asking me." 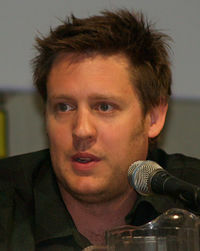 Neill Blomkamp is a South African, Vancouver-based director of short films and advertisements. He is known for directing three short live-action films collectively known as Halo: Landfall for Halo 3. Blomkamp's directorial debut, District 9, was released on August 14, 2009. His second film, Elysium, was released on August 9, 2013. Blomkamp works with RATEL VFX in Vancouver, a small studio specializing in TVC VFX. He is represented by RSA Films in Los Angeles, and Spy Films in Toronto. Blomkamp employs a documentary-style, hand-held, cinéma vérité technique, blending seamlessly with naturalistic and photo-realistic computer-generated imagery effects. In August 2006, he was selected by Peter Jackson and hired by Microsoft to direct the film adaptation of Halo, which was due for release in summer 2008 prior to its indefinite hiatus. While the film production was put on hold, Blomkamp directed three short live-action films collectively known as Halo: Landfall to promote the release of Halo 3. ↑ Hollywood: Peter Jackson Explains How "Halo" Became "District 9"